Hole in subfloor under stove: Do I fix? If so do I put flooring over it? Why does this hole exist and should I repair it? 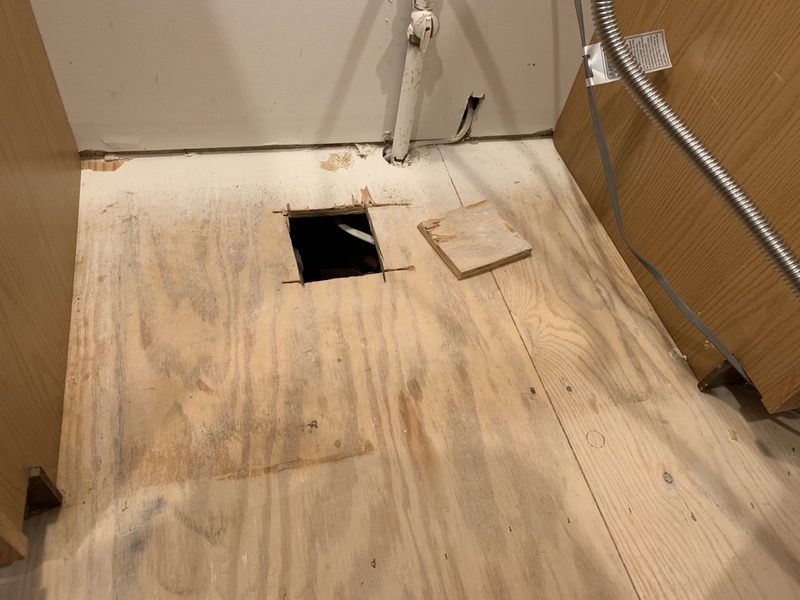 Now that the weather is turning I feel cold air coming from the hole but could there be a valid reason the subfloor wasn't repaired after work was done? Should the new flooring (porcelain tile over cement board) extend under the stove? Currently the edge of the stove sits 1/2" below the countertop. Now that I've written out my questions it seems the answers are "yes" and "yes". However I don't know what I don't know and maybe there's a good reason things were left as I found them, as janky as they seem. Are "yes" and "yes" the correct answers? I would replace the subfloor by floating some scrap lumber under two edges of the opening and screwing them in place. Then screw down the patch. I'd then run tile down both sides of the stove opening and halfway back from the front, but leave the patched area uncovered in case you need later access. This gives you the impression of a completed floor from the front and through any gaps along the sides of the stove. Personally, I would say no and no to both of your questions. I would run the tile up to and maybe slightly under the bottom edge of the stove - enough so you can't see the unfinished part underneath. If you want the stove to be flush or slightly higher than the level of the countertop, then you can just put another piece of plywood down over the subfloor (1/2" or 3/4") to raise the floor level and bring the stove up a bit higher. That would also serve to cover the hole in the subfloor. 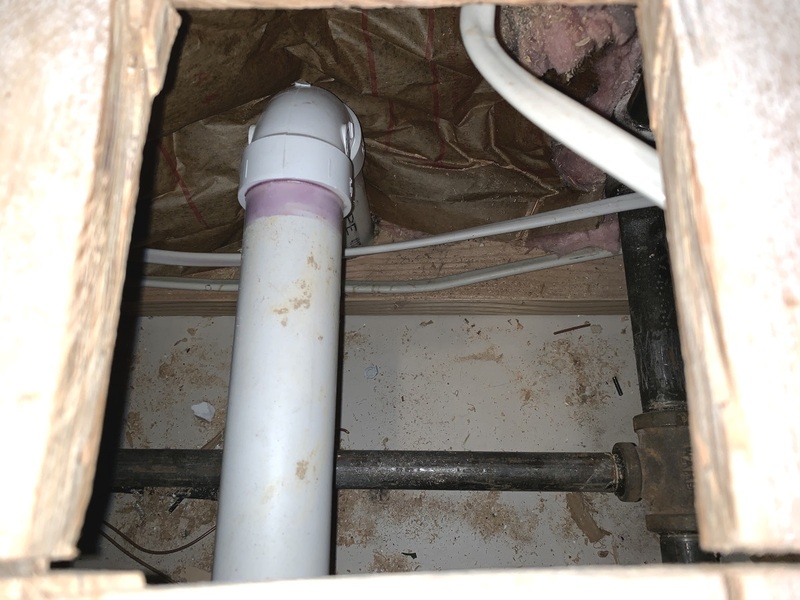 As for why the hole is there in the first place - I'd guess it was cut during a previous remodel to gain access to the plumbing/gas lines/wiring under the floor. Not the answer you're looking for? Browse other questions tagged flooring subfloor or ask your own question. How do I patch a hole in the slab under a kitchen island? How should I prepare a plywood subfloor for floating vinyl plank flooring? Is it feasible to cover low-pile carpet with a 1/4" subfloor and vinyl tile in a kitchen? How should I install flooring over fresh concrete? What is the proper waterproof bathroom underlayment for vinyl tile flooring? Install a gas stove over vinyl flooring? Is 1/2 inch plywood over 3/4 inch subfloor adequate for 12x24 ceramic tile?